Dropbox is a free cloud storage service that lets you bring your docs, videos and photos anywhere. Any file you store on Dropbox will automatically get saved on the linked PC, Phones and even in the Dropbox Website itself. This means you start working on a project at the office, save it in Dropbox folder and finish that project at your home. Now, you don’t need to mail a file to yourself. Now, finally Dropbox on Windows 8 is available at zero cost, however, offers 2GB of free storage on Cloud for additional storage you need pay extra for it. You can always check the usage by visiting accounts setting page. You would be obviously having question regarding its safety? Yes, Dropbox is totally secured to use, it uses Secure Socket Layer (SSL) and AES-256 encryption, which is used by the bank to protect their client’s data. After you install Dropbox on your PC, you will see a Dropbox folder is created. The folders look similar to other folders on your PC. Any file you save to Dropbox folder is also saved to all other linked PC, Phones and on Dropbox Website. To add files in Dropbox, you need to drag and drop files into Dropbox folder. If you see a blue icon, then the file is being synced with Dropbox. If the icon turns to green then, the file saved to all linked PC, Phones and on Dropbox Website. Allows to share folder with specific people. View the changes made to a file from previous to current version. View files on Dropbox website and on phones, I pad. Generates a link to any file in your Public folder. Also, check out our post on Opera Browser on Windows 8. Head over to the homepage to download Dropbox on your PC. Create an account on Dropbox, if you already have an account on Dropbox. Then sign-in with it. Choose required storage on Cloud (For 2GB you need not have to pay anything). 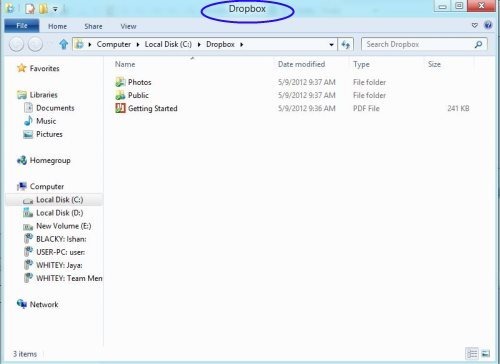 Now, Add files to the Dropbox folder created on your Windows 8 PC. Dropbox is a free service for cloud storage, but it only provides 2GB free space on cloud. These days the SkyDrive from Microsoft and The Google Drive from Google provides much more free space than Dropbox. Try it on your Windows 8 PC. How do you save a pdf file from an email into your dropbox on Windows 8?